Back at it for your favorite Friday enjoyment: Keep It Real Friday. Getting after it . .
Roy 'Doc' Halladay is the flat out best pitcher in the major leagues, and he has been for some time. Since 2002 the Toronto Blue Jay right hander has won 12 games or more six times, including 3 seasons of 19 or more. Forget putting Royals break out star Zack Grienke on the cover of SI, Halladay has already won seven games and is a large reason why the Blue Jays are in first place in the almighty American League East. Feasting on American League batters like no Blue Jay has done since Juan Guzman, Halladay has struck out 95+ batters every year since 2001, including two seasons which he went over 200, yes 200 batters. The 32-year old work horse is racking up wins in a city where the 'W' actually means something given the lack of offense they've had for the past several years, excluding this season. In 2009, the pitcher known to Blue Jay fans as 'Doc,' shows no signs of slowing down. In 8 starts Halladay has an earned run average slightly under 3.00 and has walked just seven batters compared to the 49 he's struck out. So when your talking Beckett, Sabathia, and Lincecum, I'm talking Roy Halladay, KEEP IT REAL! Steroids, Favre, and Octomom is the answer. What are three things I wouldn't mind living my life without is the question. Here's the thing about steroids and baseball, it's all fraudulent the whole notion. Baseball cares now, after the media blew it up, but ask yourself whose head was in the sand when Brett Boone and Brady Anderson were having 50-homer seasons? Now they want to march around and pound the table, get a grip people they knew what was going on then and did nothing because of the piles of cash coming through the back door. However, now with the media latched on to it, they are going to care? Fraudulent. 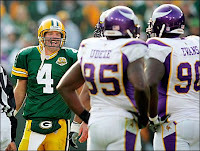 Brett Favre, I could name twenty quarterbacks I'd rather have under center, maybe even 25. Maybe he is injured, maybe he's just old, but either way I'm all done. Manning, Brady, Roethlisberger, Brees, Rivers, Cassel, Romo, McNabb, E. Manning, Campbell, Hill, Delhomme, Ryan, Flacco, Warner, Palmer, Schaub, Collins, Cutler, Rodgers, Hasselbeck, Orton, and Pennington. Pass on Favre. Octomom is out there, I mean really out there. I have some questions for her: Has Marvel Comics contacted you about a sequel to Spider Man? How awesome will your future Mother's Day be? 8 kids buying you presents? Sweet. Actually, scratch that it's all a little too crazy for me to comprehend. KEEP IT REAL! . . . . .I'd hop on my soap box and scream about Glen Davis covering Rashard Lewis, but I'm too upset. Thanks for reading.